Maybe some of you have ever tried trekking to Lake Kelimutu but some may still dream to visit it. The Lake has three colors where it is located on the Summit of Mount Kelimutu National Park. A trip with a rental car with a capacity of 7 seats will keep you be entertained with impressive views along the road for several hours. The winding trip that connects the island by the lenght of 350 km is a worth price for the beauty of Flores that should be discussed. National Park of Kelimutu is the smallest national park of 6 national parks in Bali and Nusa Tenggara. However, the size is not important when you witness the natural beauty that is offered in National Park of Kelimutu. Here there are three lakes located on the summit of Mount Kelimutu where the third has the same name and known as Lake Kelimutu. Each lake has different meaning also has different colour. Those lake is believed as a place for the spirits and also believed has powerful nature force. Lake Kelimutu is popularized by a netherlander named Van Such Telen in 1915. The beauty is widely known after Y.Bouman describe its beauty and the change of its colour on his script in 1929. To reach the lake, you can start from Moni, a small city where moni is the basecamp of the backpackers. The beautiful scenery along the road to the Lake is very beautiful. The most western lake named Tiwu Ata Mbupuyang where it means "A lake of the elderly souls who has died". The lake located in the middle named Tiwu Muri Koo Fai or "A lake of the young souls who has died". The most eastern lake named Tiwu Ata Polo or "A lake for the souls of evil man". You will be surprised if you don't know that the colour of those lakes always be changed. There are another lake in the world where the lake's colour can be changed like Lake Blue in Mount Gambier, South Australia where the blue colour can be changed into gray color and also it can be predicted. There is also Lake Yudamari on Mount Nakade, Japan where the change of its colour from turquoise color into green. The change of water colour of Lake Kelimutu can't be predicted. Sometimes the colours are blue, green, and black and at other times are white, red, and blue, and several times ago the colour is dark brown. Scientifically, the color change of Lake Kelimutu because of the factor of mineral content, moss, and stones in the crater and also the influence of sunlight. 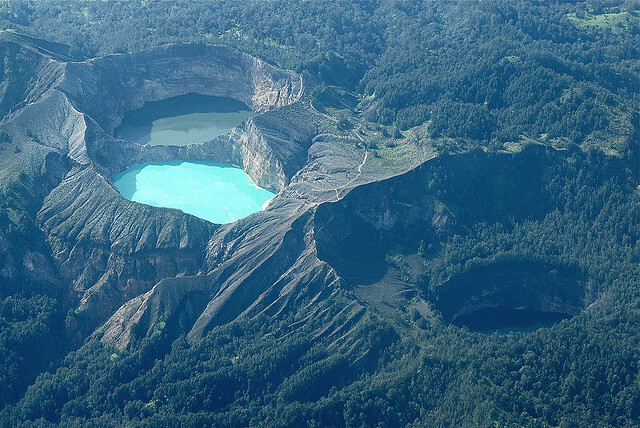 The scientist believe that this lake is formed from the volcano eruption in the past. This phenomenon has attracted the geologist attention because of the presence of the lake that has three different colours but located in the same mount. The local community in Moni believe that the people who live around the lake have done evilness and died. Here also can be found tikus gunung (Bunomys naso), buffalo (Bos javanicus javanicus), roe (Muntiacus muntjak nainggolani), mongoose (Pardofelis marmorata), pangolin (Manis javanica), porcupine (Hystrix brachyura brachyura), and mouse deer (Tragulus javanicus javanicus). The local community believe that the lake is a place for the spirits of the dead man. The area of Kelimutu is surrounded by forest overgrown by various plants that seldom be found in any other place in Flores. Besides pine tree, there are also ferns, redwood, and edelweiss flower. Pine forest grow thrives in Mount kelimutu. Another area from this mount is barren with unstable sand and ground. The local community believe that Mount Kelimutu is a sacred mount and as a fertility source. Climbing is the main reason of the tourist come to Moni or Ende. Several parts of national park is forbidden to visit because of the geothermal is unstable. The safest trekking is located between Moni and Mount Kelimutu. The long of trekking is about 12 km and needs 30 minutes. Visitors only can walk around Lake Kelimutu but not all of area can be explored because of several areas are dangerous. If you want to trekking, you can go through the route from Moni to Kelimutu where it's shorter than using car. The distance from Moni to the summit is about 12 km. The distance from Moni to the parking area is about 11 km, visitors have to climb the summit through mountain hiking trail and it needs 30 minutes. There are several places you can visit like Blue Stone Beach, Site of Bung Karno's house, and of course shopping in Ikat market. If you wanna go shopping, local souvenirs is available in parking area. You can find ikat fabric, woven fabric special from Flores. Every regencies in Flores has different motif. Here the shop list that sell ikat fabric, various type of handicraft and antique goods. Kelimutu is located in Koanara village, sub-district of Wolowaru, 66 km from Ende city and 83 kilometre from Maumere. Moni is the closest city, located in the foot of Mount Kelimutu. This small city is the gateway to Lake Kelimutu. The distance between Moni and Kelimutu is 15 km. You can use ojek (rental motorcycle), car, or public transport to bring you up to parking area before you start your trip to the summit of Mount Kelimutu. There are some buses to Ende from Maumere through Moni. The local people called the us as "wooden bus" or "oto kol". Over there, you have to walk 15 km approximately to the lake location. Everyday, there are flights from Denpasar and Kupang to Maumere. If you want to get more complete information, you can go to Labuan Bajo or Flores. Kelimutu usually covered by fog. It will be better if you visit it at 3.30 AM so you can witness the atmosphere of the amazing sunrise. This is the best atmosphere to witness the scenery of Lake Kelimutu. The best time to visit to Lake Kelimutu are on July and August. Please order one or two hotel rooms two months before your visit. For the accommodation, Mony city only offer the simpleness that might be suitable for the backpacker. The bungalow here is far from luxurious impression. If you want to stay in the comfort place, Maumere is the right place because of the distance is only 4 hours. In Ende also can be your choice where there's Grand Wisata Hotel over there. Kelimutu Crater Lakes Ecolodge is built in 2010 and the distance is only 20 minutes by using motor vehicle to National Park of Kelimutu. In here there are hot water and clean bathroom. This place is environmentally friendly hotel. So far, the resort is the best resort and the best accommodation. Some toursits spend their honeymoon here. Watugana Bungalow is the comfort and suitable inn for backpacker. The bungalow has 5 rooms that is located in the first floor and the other are in upstairs. every rooms has each bathrooms and also valance. The price is about Tp 150.000 until Rp 250.000. For ordering the room, you have to believe that John (The bungalow keeper) inform you about the room availability. Phone number : +62 813 3916 7408 (John). Bintang Lodge nowadays only has one rooms but the interior still new and clean. The rooms use air conditioner and it has hot water, also there is cafe named "Bintang cafe". The room price is Rp 250.000 per night. Hotel Arwanti located in Moni area. The hotel has 2 rooms with simple bathrooms. This bungalow is a part of cafe Arwanti and restaurant that is managed by local people over there named Andre. Hotel Flores Sare is a hotel which is often used for meeting and workshop. The lobby is fascinate with Jesus christ statue fill almost all rooms. The rooms is good enough but you can ask the staff over there to clean up befire you enter it. 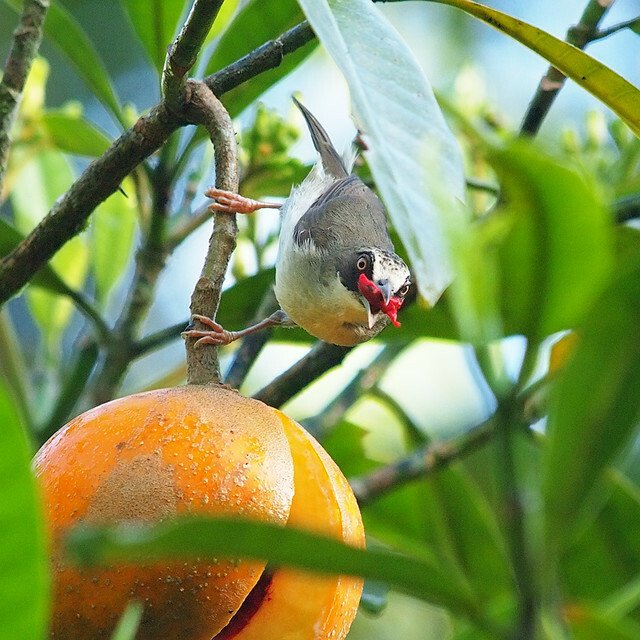 Flores sare is close with Kelimutu Center Lake Ecolodge and can be contacted at : +62 381 21075. Sao Ria Wisata has the incredible scenery where around it there are vegetables garden. Before you enter to the room, you can ask the hotel staff to clean up all room facilities. I'm planning a trip to Moni soon and this post was extremely helpful! Thanks for the detailed information!